We Are Ready, But Is Le Mans? Presented by: Gareth Jones and Zog, with Stevie Sackin, Damien Sung, Alex Goy, Dave Galpin and Martin + Guilliam, Marlo & Pierre. 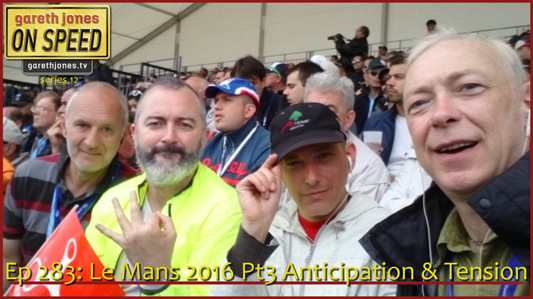 #283 Le Mans 2016 Pt3 Anticipation and tension as the On Speed team take position for the start and pick cars in the greatest race in the world. Zog’s odd race footwear, discussing car sounds with Alex Goy, meeting On Speed listeners and local race fans.